Hand taping is tiresome, costly and does not always ensure the perfect seal. 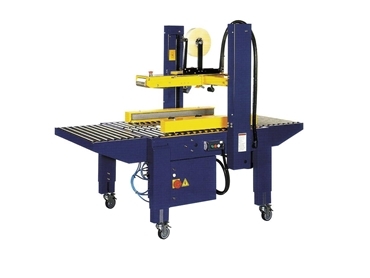 The 105SDR Side Drive Random tape sealer, available from Australian Warehouse Solutions automatically adjusts to tape different sized boxes and applies tape at a speedy 23 metres per minute. The tape sealing machine automatically dispenses the exact amount of tape, reducing tape wastage. The simple and reliable design of the AWS 105SDR tape sealing machine ensures guaranteed performance and increased efficiency. The tape sealer is ready for immediate use. Simply plug in and switch on. The machine is built on sturdy wheels for mobility in the workplace and can be easily inserted into an existing conveyor line. The AWS 105SDR and a full range of tape sealing machines are available from Australian Warehouse Solutions (AWS). AWS recommend the use of Rhino tape with the EXC 105SDR tape sealer. Rhino tape’s unique natural rubber formulation delivers trouble-free performance on both conventional and recycled boxes.